What is the best way to help your toddler prepare for a new sibling? One of the many things that I worried about when I was pregnant with our second child was how our 2-year-old daughter, Zoe, would react to having a new baby in the house. Actually, if I’m being honest, it was my NUMBER ONE concern. Would she feel jealous? Left out? Completely traumatized by this new ginormous life change? After our new baby boy was born our daughter was very affectionate and loving towards him. Now that he is 4 months old, she can’t stop giving him hugs and kisses at least 5 times a day. It melts my heart every time. But this new fondness for her baby brother didn’t come without a few hiccups along the way. Now looking back with my 20/20 vision I know she acted out a little. Not directly towards him, but in her own not-so-subtle “I’m throwing a tantrum but I just want a little more attention” way. Since then she has adjusted quite well. But it has been a learning experience for all of us! We have learned so much about our first born since the arrival of our new baby. #1. Talk about it with them frequently. Don’t surprise your toddler by bringing in another tiny human behind their back. One of the best ways to help your toddler prepare for a new sibling is to start talking about it with them. Start the talking at least as soon as you tell family and friends about your pregnancy. Your toddler will need time to process this information about the upcoming change. #2. Explain the role of big sister (or brother). We reminded Zoe daily that she was going to have a lot of new responsibilities when “baby brother” arrived. It was important to us that Zoe see that she would have a very important role as big sister so that she didn’t think she was being left behind. For example, when she played with her puzzles we reminded her that she would need to teach her little brother how to play with puzzles also. Also, explain that your toddler will need to “look out” for their new sibling, and how special the role of big brother or sister will be. They will enjoy hearing about how the baby will want to try and do everything they do! #3. Give them their own “baby” to practice with. When I was about 5 months pregnant my mom bought Zoe a baby doll. Our goal was to try and teach her how to be “gentle” with the baby. She actually took to it quite well and enjoyed playing with it. When ever we talked about the new baby coming we would say “where is Zoe’s baby?” She was able to have her own “baby” to practice with and she loved it. Now that her little brother is 4 months old, she still enjoys playing with her baby in her crib at night. #4. Give your toddler books about becoming a big sister or brother. We gave our daughter 2 new books about becoming a big sister and read them to her almost daily. She loved pointing to the Mom’s belly and saying “baby in there!” Having pictures to look at really helped her process the idea of having a younger sibling. In addition, reading the big sister books gave us a regular reminder to continue talking about and including our toddler in conversations about the new baby. #5. Give them a gift from the new baby. Right after our son was born, we gave our toddler a new picnic set that was a “gift” from her little brother. When she played with it we talked to her about how she could have a picnic with her little brother soon. Our newborn also “gave” our daughter a new “I’m a big sister” shirt (in purple, her favorite color!). She felt like a million bucks. This one was so important to us since there is a lot of attention put on a new baby. We didn’t want our daughter to feel left out of the excitement or hold resentment towards him. Our goal was to keep our attention equally on her as much as we could. 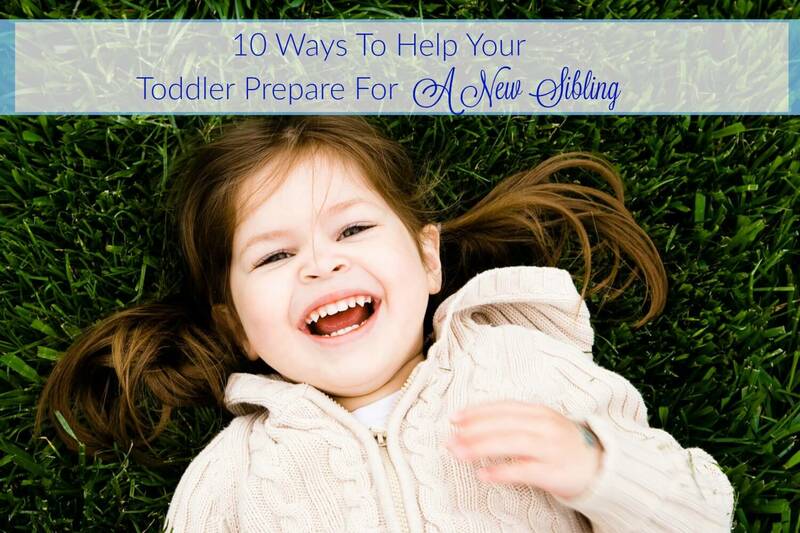 Here are 10 simple ways to help your toddler prepare for a new sibling! #6. Talk about how much fun it will be. My husband did a great job of talking to our two-year-old about how “fun” and “cool” being a big sister will be. He really embellished on the fact that he would learn so much from her and look up to her. Even now when we try and teach Zoe a new life lesson we talk about how she needs to be a good role model form her little brother. She just loves it! #7. Praise your toddler for being the best big sister EVER. #8. Stay calm during meltdowns. If there’s one thing I’ve learned as a mother it is that my child reacts to how I act. Melt downs are inevitable. It an unfortunate, but completely normal part of toddler hood. However, if I become upset then it only upsets my daughter worse. I learned this lesson the hard way after taking several road trips with my toddler. Having an additional child in the home only makes things more stressful and easier to lose it when one kid is getting crazy. #9. Give them a little extra attention and love. During the last few weeks of my pregnancy I made sure to spend a little extra time in the evenings preparing for bed with my daughter. We would spend 15-20 minutes reading books and then turn the lights off for another 15 minutes of “snuggle time.” There is no better way to help prepare your toddler for a new sibling then by showering them with a lot of extra love. This one never fails. Gratitude helps me handle difficult situations with more grace. At the end of the day I am so grateful to have two beautiful, healthy children. Even if it means months of newborn baby exhaustion, a messy house, and total craziness for a while! Since it was my second and last pregnancy, I knew I wasn’t going to get this experience ever again. So I wanted to enjoy it while it lasted! 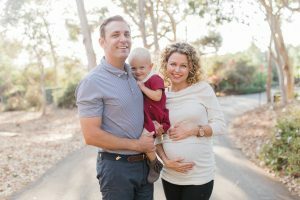 Are you the parent of a toddler who is expecting a new baby soon? Are you doing anything to try an ease the transition for your toddler? I would love to hear so please leave a comment with your thoughts!